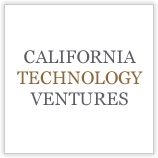 California Technology Ventures LLC (CTV) is a venture capital fund that makes direct investments in technology and life science companies. CTV has built a strong reputation for its entrepreneurial approach to investing and working with companies. They believe in guiding entrepreneurs through the strategic, operational, and management decisions critical to a company’s success, in addition to leveraging their resources and people to achieve category leadership. CTV participates in seed/start-up companies, first and second round investments, and later stage investments around the world..